With the start of the Drum Corps International Summer Tour less than two months away, we're taking this opportunity to clear the shelves in our warehouse to make way for brand new 2012 products coming soon! From now until Monday, May 14, you can save 20% on all in-stock DCI merchandise at store.DCI.org. Everything including T-shirts, hats, sweatshirts, CDs, DVDs, Blu-ray discs, and even clearance merchandise has been marked down, giving you access to hundreds of items at their lowest prices of the year. 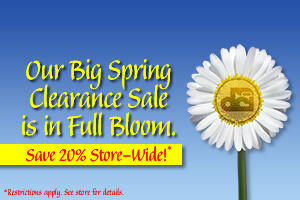 Enter coupon code SPRING12 during the checkout process to save. This promotion runs for a limited time only. Order before Monday, May 14 to take advantage of these sale prices. Certain restrictions apply. Offers cannot be combined with other promotions or discounts. Offers not valid on prior purchases. Offer expires at midnight (12 a.m. ET) on Monday, May 14, 2012, and cannot be applied to 2012 merchandise, 2012 Grand Reunion and hotel packages, Friends of DCI scholarships or memberships. Drum Corps International reserves the right to modify or cancel promotion at any time.